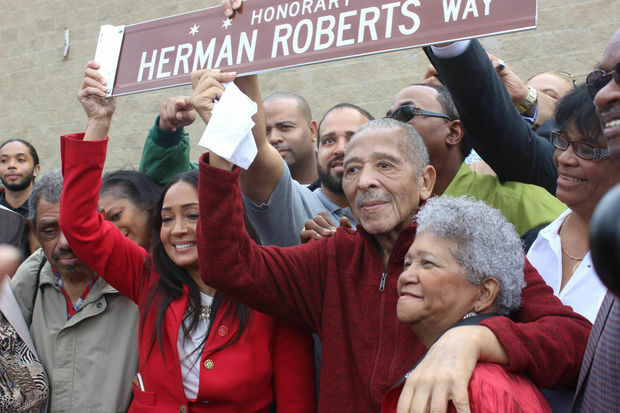 Herman Roberts, founder of the Roberts Motel chain, had an honorary street sign named after him on Oct. 7. WOODLAWN — Honorary street signs will be a constant reminder of the work started by three legends. 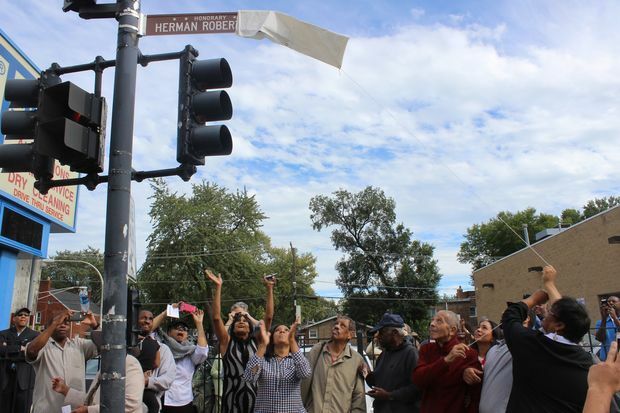 The community joined family and friends Friday for an honorary street-naming ceremony for the two late founders of the Chicago Crusader newspaper, Balm L. Leavell Jr. and Joseph H. Jefferson, and Chicago motel entrepreneur Herman Roberts. The street signs were unveiled on South King Drive from 63rd to 67th streets. Ald. Willie Cochran (20th), historian Timuel Black and former 3rd Ward Ald. 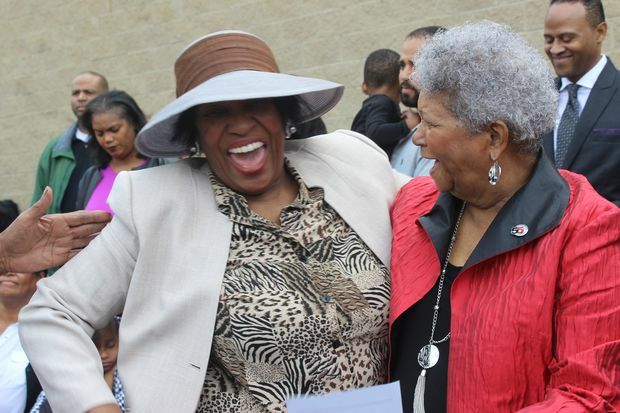 Dorothy Tillman joined dozens of others gathered in a parking lot half a block south of the Crusader’s location at 6429 S. King Drive. “It was just a wonderful fit for the three of them to be honored at the same time,” she said. Leavell, who took the reins of the Crusader after Balm Leavell Jr.'s death in 1968, said that Roberts is an example of a true entrepreneur. He became a prominent motel owner, known best for the sixth Roberts Motel in Chicago. The businessman wasn’t born into wealth. Like thousands of African-Americans during the Great Migration, his family moved from Oklahoma to Chicago. He was 12 years old at the time. As he got older, he established a strong work ethic with an entrepreneurial spirit, family said. Roberts went from working odd jobs like delivering papers and washing taxis to driving a cab himself. Eventually he owned his own cab company and after returning home from the military in 1947, he continued working. In 1953 he opened the Roberts Show Club, a small lounge on the South Side. Big name entertainers, including Sammy Davis Jr., Redd Foxx, and Della Reese performed there. Because of segregation, the black entertainers had nowhere to stay when in town and Roberts would put them up in friends’ homes. That’s where the idea to open a black-owned motel came from. In 1960 he opened his first, and in 1970 he added a sixth to the chain. Just like the motels were created out of necessity, so was the Crusader, Leavell said. African-Americans knew they had a chance of getting published in black-owned papers like the Crusader when other publications would turn them away. The paper has held true to its legacy, Leavell said, while still embracing the future of news media. Tillman applauded the Crusader’s founders and urged the black community to unite and continue their legacy. Leavell’s son, Antonio Leavell, said that he’s proud to be a part of the work that has been done so far and there is still more to do. “I’ve been seeing progress, but I know a lot more needs to be done,” he said.